When I first got my hands on the Nokia N8 ($550 unlocked; price as of October 3) back in June, I was impressed with its hardware and multimedia features, but had the feeling that the software was stale and outdated. After spending more time with the N8, I haven’t changed my opinion very much. If anything, I am even more impressed with the attractive hardware and the fantastic camera—which makes the dated OS even more frustrating. The N8 gives the impression of being a high-end device, starting with its attractive, blue box. Opening the box reveals the equally good-looking phone and all of its accessories: an HDMI cable, earbuds, a wall charger, and data cable. When held, the N8 feels lightweight yet sturdy. The scratch-proof metal chassis gives the phone a luxurious but durable feel. The N8 comes in five attractive colors: dark gray, silver white, green, blue, and orange. The face of the phone is minimalist, with the 3.5-inch 640-by-360-pixel display dominating its face and a single hardware button below it. This hardware button lets you switch between the homescreen and the menu screen; and when held down, it shows you all of your open applications. The right spine of the phone houses the microSD slot (the N8’s memory is expandable up to 32GB) and the SIM card slot. The micro-USB port is located on the right as well. On the left spine, you’ll find the oblong volume rocker, a ringer off-and-on switch, and a dedicated camera key. The power button, a 3.5mm headphone jack, and an HDMI port are located at the top. 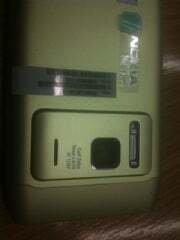 The rather large 12-megapixel camera, equipped with a Carl Zeiss lens and a Xenon flash, is on the back. Annoyingly, the N8 does not have a removable battery, so you’ll have to attack the device with a screwdriver to get the back cover off. I dislike Symbian’s typography. The boxy, small text just looks so late-1990s to me, and it isn’t easy on the eyes. When Nokia announced the Symbian S3 revamp, I had hoped for cleaner, more modern-looking typography and aesthetically pleasing icons. But S3 looks more or less the same as the previous version with some tweaks and added features here and there. A few features in the software didn’t strike me as user-friendly. For example, unlike the iPhone OS, Android, and WebOS, S3 doesn’t allow you to upload photos or videos to your social networks directly from the camera or gallery app. Instead, to share your photos, you must go into the dedicated Ovi social networking client, which aggregates your social networking accounts into a single app. The on-screen keyboard felt cramped—even more so than the native Android keyboard. In portrait mode, you’re stuck with a 12-key alphanumeric keyboard.This may be a nice trip down memory lane for some people, but it’s incredibly annoying to use. I found myself always using the keyboard in landscape mode, which meant having to text two-handed rather than one-handed. You also get only three homescreens to work with. For some users, three may be enough to accommodate all the widgets they need, but I wanted more. The widgets are all of identical size, and they’re rather large, so you don’t have a lot of room to work with. If you want to add a shortcut to an app on your homescreen, you must open the “shortcuts” widget; you can add a total of four icons on there. The process is a lot more complicated than Android’s system of adding a widget or shortcut simply by holding down the touchscreen. Arranging widgets is a bit of a pain as well. You can’t move a widget between homescreens; instead, you have to delete it from one homepage and then add it to another. Moving widgets around on the same homepage is a simple matter of holding and dragging it to the desired place, but the OS’s slow reaction time makes this task unduly frustrating (see Performance below). Despite these tweaks, Symbian S3 feels outdated and overly complicated in comparison to the Android OS and iOS. Simple tasks—such as adding shortcuts to your homepage—are more difficult to perform than they should be. The Web browser’s interface is unnecessarily complicated, too. For example, to get to your toolbar while viewing a page, you must hit an icon in the corner to call it up. You then have three unlabeled icons to work with. Anybody unfamiliar with the Symbian browser will be puzzled by these icons and what they do; in fact, they all perform slightly different functions, with some overlap. The browser renders pages quickly over both Wi-Fi and 3G connections. Though it doesn’t have full Flash 10 support, the browser does work with Flash Lite, so you can play some videos. Overall, the video-watching experience is brilliant on the N8’s OLED display. The phone supports HD quality video and Dolby Digital surround sound—a boon for movie junkies. I hope that Nokia makes purchasing movies easy—and available to U.S. audiences. Nokia says that the built-in 12-megapixel Zeiss camera has the largest sensor on any phone. It certainly takes incredible photos. I snapped a few shots and was impressed at how bright and natural the colors looked and how sharp the details were. The camera also captures 720p HD video, which looked great on both the phone and when played back on an HDTV. Playback was smooth and crisp, with bright and natural colors (for a look at how powerful the N8’s camcorder is, check out this stop-motion video shot with the phone). The N8 has HDMI-out so you can play high definition videos from your phone to your home theater. Even better, Nokia includes the HDMI adapter in the box (unlike the way another company I can think of handles its HDMI-capable smartphone). Nokia also supplies a front-facing camera to handle video calling. In terms of responsiveness, the N8 was hit-or-miss. I noticed a bit of a lag when flipping between the homescreens. On an iPhone or an Android device, the page turns with your finger when you flip between homescreens. With the N8, you swipe first and then the screen moves. Web browsing was speedy, but the browser did crash on me once during my tests. Call quality on the N8 over the AT&T network was excellent. Voices sounded loud and clear with no distortion or static. Though we didn’t conduct any formal tests, the N8 had very good battery life in my hands-on tests. The phone lasted for a full weekend of normal use (a few phone calls, text messages, video, and a few hours of music). Nokia’s excellent, free navigation service Ovi Maps comes loaded on the phone. What makes Ovi Maps better than say, Google Maps? Nokia has been aggregating data and building its mobile mapping technology since the company’s acquisition of digital map supplier Naviteq. Ovi Maps shows local country data as well as more than 6000 3D landmarks. Users also have access to data from Lonely Planet and Michelin travel guides. Ovi Maps doesn’t require a network connection for navigation, so you’ll conserve your phone’s battery life and you won’t be thrown off by cellular dead zones while on the road. Ovi Maps uses “hybrid vector maps,” which Nokia says are high quality yet less data intensive so you can store them on your phone after downloading them. In contrast, Google Maps will cache along your planned route so you can continue to receive turn-by-turn directions to your destination even if you hit a dead zone; but if you try to switch to another map or plan another route, Google Navigation won’t work. The N8 is a remarkably hot-and-cold phone. It has some amazing features, such as the camera and video support, but the software is almost too frustrating to work with. I can onlyt imagine what a superphone the N8 would be if it had a different OS. Symbian needs a complete overhaul in appearance, functionality and performance; little tweaks here and there just won’t cut it. I’m excited to see where Nokia’s Meego platform with Intel may go, but we may have to wait awhile before any phones start to surface. The lack of a carrier partner may hurt Nokia N8 sales; Nokia confirmed that the N8 will be sold “through the usual N-series channels.” This means that the phone will be sold unlocked via Nokia’s Website and from other retail partners. Nokia has made a big deal about reaching out and working with American carriers—AT&T in particular—so at some point a carrier is likely to offer the N8 at a subsidized price. This story, "Nokia N8: Hardware impresses, software underwhelms" was originally published by PCWorld.